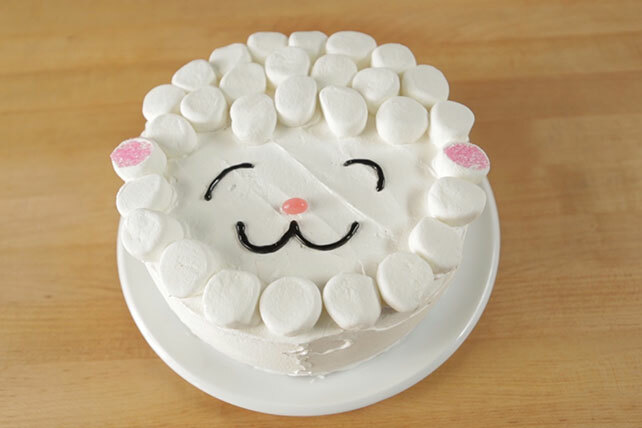 Watch our video to discover how to make this adorable Easy Lamb Cake at home. Our Easy Lamb Cake is perfect for Easter and all throughout the spring. Cover bottoms of 2 (9-inch) round pans with parchment; spray with cooking spray. Prepare cake batter as directed on package. Stir in dry gelatin mix; pour into prepared pans. Bake 25 to 28 min. or until toothpick inserted in centers comes out clean. Cool cakes in pans 15 min. Invert onto wire racks; gently remove pans. Cool cakes completely. Place 1 cake layer on serving plate; spread top with 1 cup COOL WHIP. Cover with remaining cake layer. Frost top and side of cake with remaining COOL WHIP. Press cut sides of 2 marshmallow halves in colored sugar; gently press into COOL WHIP on cake as shown in photo for the lamb's ears. Decorate cake with jelly bean, decorating gel and remaining marshmallows as shown. Use kitchen shears to cut the marshmallows in half.